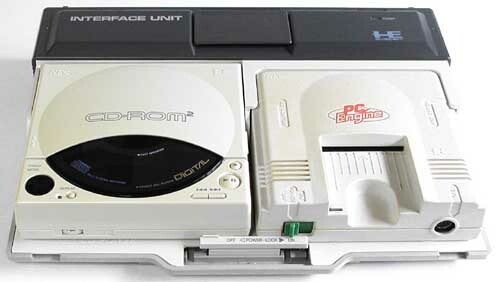 I desperately want a PC Engine CD-ROM2 peripheral. I know what some of you are thinking: That doesn't seem all that insane. Plenty of people probably want a PC Engine CD-ROM2 peripheral! I'd love to agree with you, but I can't. Why? Because I already own a PC Engine Core Grafx II console and its piggybacking Super CD-ROM2 peripheral. (Here's a photo of both of them, and here's another.) As such, picking up the original CD-ROM2 attachment at this point seems at best a bit silly and at worst completely bonkers. PC Engines are beautiful consoles, I used to own three different types just because they were so cool, so I'd say you were pretty normal for wanting another one! I don't think that's crazy at all. I've got a Turbo Express, 2 TurboGrafx-16's, the TurbGrafx-16 CD (Attached to one of the TG-16's), and a PC-Engine Duo-R, and I'd still want that. They are, aren't they, Kimimi? I especially love the original white ones :) BTW, how many PCEs do you own these days? Hopefully you still own at least one?? I love the design of the PC Engine. I only ever owned the Turbo with CD and then eventually a TurboDuo. Whenever I'm in Japan, I get so tempted to pick up an old console. I've been eyeing the NEOGEO for years. Ha ha! Thanks, Darwin :) I've wanted ever since I saw one in an early issue of EGM. I've got the white PCE, now I just need the CD-ROM2 and its 'interface unit.' Unfortunately, they're hard to come by, even on eBay, and when they do show up they're either hideous (discolored, dirty, etc.) or expensive -- or both! Sigh. I saw your pics of your NEC collection - they are in great condition!! I can see why it's tough to find one. The only thing I picked up recently that was a bit eccentric is a Dragon Quest 3 famicom cart. But it was less than $10 :). That cover art had a lot of childhood memories attached to it - mainly from just wanting it so bad back in the day. Thanks, Darwin! Yes, thankfully my PCE hardware and even most of my PCE games are in great condition. I'm not looking for a perfect-condition CD-ROM2 system, BTW -- certainly not boxed, etc. -- I'd just like one that isn't horribly discolored and comes with all of the parts/pieces. Bryan - I currently own no PC Engine at all! I've been economising a bit since my son was born and cutting out things I don't really need, and the PCE was one of them. I still buy and play the games, but it's easier and cheaper to play them through an emulator on my laptop than trying to hog the TV (without save states!) or find space to keep a Duo. Oh, that's a tragedy, Kimimi! Just kidding. Kind of :P Actually, I understand to a good extent. Even though I own two PCEs, I tend to play PCE games via emulation rather than hook up the systems, etc. That said, I don't spend as much time with them when I play via emulation vs. when I play the real thing, so maybe I should do that more often... Which PCE games are your favorites, by the way? I love discovering new RPGs and adventure games on the PCE - so things like Patlabor: Chapter of Griffon or Masaya's SRPGs. For the action side of things Final and Super Star Soldier, as well as Bomberman '94, are some of my favourites. Bryan--I can't promise that it will ever see the light of day, but one of my Duomazov brothers has been working on a War of the Dead translation, and from what I understand, it's in a near-complete state. Testing still needs to be done, and there's no telling what that will uncover, but I'll try to keep you posted if the translation is something you'd be interested in. Kimimi--You enjoy Masaya's strategy games... have you played Macross Eternal Love Song? It's a favorite of mine. And as you like the Soldier games as well, have you tried Soldier Blade and Star Parodier? Both fun games, especially Blade. I've got both Soldier Blade and Star Parodier on that PSP collection... not really spent all that much time with them to be honest, I tend to jump straight for Final/Super! Oh, that's great news, IvaNEC! Yes, if you can, please keep me informed. I've always wanted to play War of the Dead, even though I know it's not a *great* game, but playing it in Japanese seems waaaay too daunting at this point. BTW, it's a crying shame that more PCE fan translations don't exist. So many games could be translated into English, yet fan translators spend their time with random Famicom and Super Famicom games instead. Now, I like Fami and Super Fami games as much as anyone, both they're not the games that need to be translated at this point! I have one of these but I`ve never been able to tell if mine works or not since I don`t have the cables. Just about every different version of the PC Engine and its add ons has different AV cables and AC adapters, it is so maddening. Anyway, I hope you find one with the cables! Oh, I forgot that you have one of these, Sean. I'm guessing you have at least one PC Engine, too? Do you also not have cables for that/those? Yes, I have the grey and orange one with the AV cables instead of the RF output. Forget what it is called. That is the only one I can actually use. I have one of the original white ones, which I don`t have the RF cable for, and the CD-ROM2, ditto, and also I have the Duo, which I have the cables for but it is simply broken. So that means that I can only use 25% of my PC Engines. Ah, that's the Core Grafx II, Sean -- the third and last PCE released, I think. I have that one, a white one and a Super CD-ROM2. Crazily enough, I actually plan on picking up an AV Booster so that I can connect my white PCE to my TV, even though my Core Grafx II is perfectly capable of that already. Anyway, I'm sorry to hear you're drowning in PCEs but can only play one of them! Hopefully that'll change sooner rather than later. It really is an awesome system.